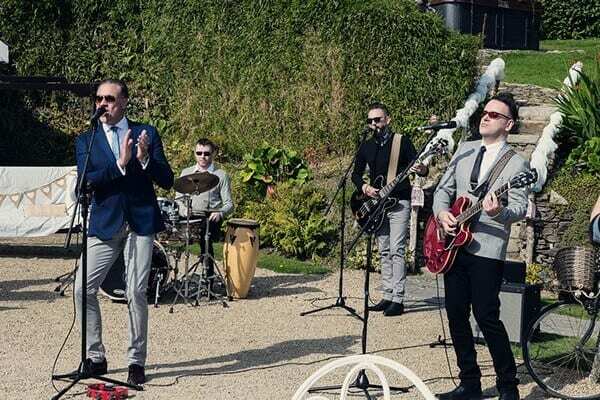 Here are a selection of Wedding Band Videos from Irish Wedding Awards Nominated Wedding Band 2018 The Jukebox Kings, for you to view and review. Thank you for visiting Wedding Bands Ireland The Jukebox Kings Wedding Band and DJ Videos page. While we fully recognise that nothing beats seeing a live band in person, listening to and viewing the interaction between band members and the Audience. We are also aware that it’s not always possible to come and attend our regular Showcases. On Our Video page, it is possible to see the Band perform during our Studio Video’s and also during live performances in situ at Weddings around the country. Wedding Bands Ireland – The Jukebox Kings the Leading Irish Wedding Suppliers of Professional Entertainment. Irish Wedding Awards Wedding Band Finalist. Book Now for 2019/2020. Obviously, you are always more than welcome to attend one of our regular Showcase events but in the meantime, we hope that our Videos provide you with a little flavour of what the Band is about and how we approach every single wedding with the same enthusiasm and energy. As suggested by The Wedding Band Association it’s important to view your Band and ensure that the Band you book is the Band that turn up on the night. Wedding Band Videos of The Jukebox Kings. Wedding Band Videos of The Jukebox Kings. Featuring The 5 piece Wedding Band The Jukebox Kings filmed on location.